Good grief. Today was the first half-day of spring and it felt like some other place and time. Grey, damp, icy. Starting tomorrow, the sun better start appearing for longer each day or else I’ll go mad. It’s time to start the seeds for the garden but thinking of last year’s torrid temperatures seems more like fantasy than reality. I’m happy with my stats this week. 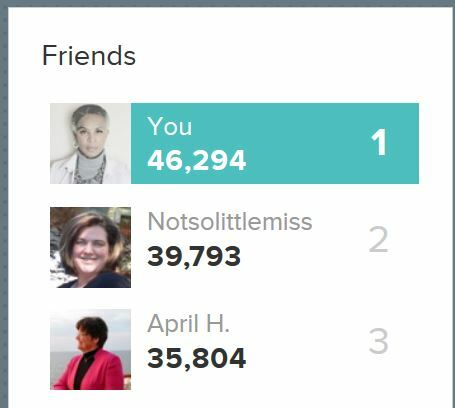 As you can see from the FitBit summary, I’m #1 – for now. Notsolittlemiss forgot to wear her bracelet for a few days and that’s why her stats dropped so precipitously. When I saw her yesterday in the hallway though, she vowed to get back to pounding out a couple of thousand steps a day. Game on, Sister! Nothing like a bit of friendly rivalry to get the feet in motion. Today was a slower day because I wasn’t in the office. Although I intended to do a mall walk, I decided I didn’t want to be bothered. I know, not the best of motivational moods, but you gotta do what you gotta do. Or not do. I spent a productive couple of hours with my beta reading buddy A.H., talking about how we can improve the writing we’ve exchanged the last few weeks. Our work is so different – she writes memoir; I write fiction, non-fiction and short stories. We have different perspectives on our work, but we share helpful opinions about good writing. I’m beginning to feel more confident about my editing, although I have a habit of living in my character’s heads and expecting that my readers will understand what they do as well as I do. But as I move on to editing the next dozen or so chapters, I have a clear goal in mind. The ugly dirt-capped mountains of snow along the sidewalks have started to melt and I’m looking forward of bundling up and getting back to my regular walks around the neighbourhood. Tomorrow, it’s back to work and my half-hour lunchtime walk circuit. If it’s warm enough and not rainy, I may venture outside.